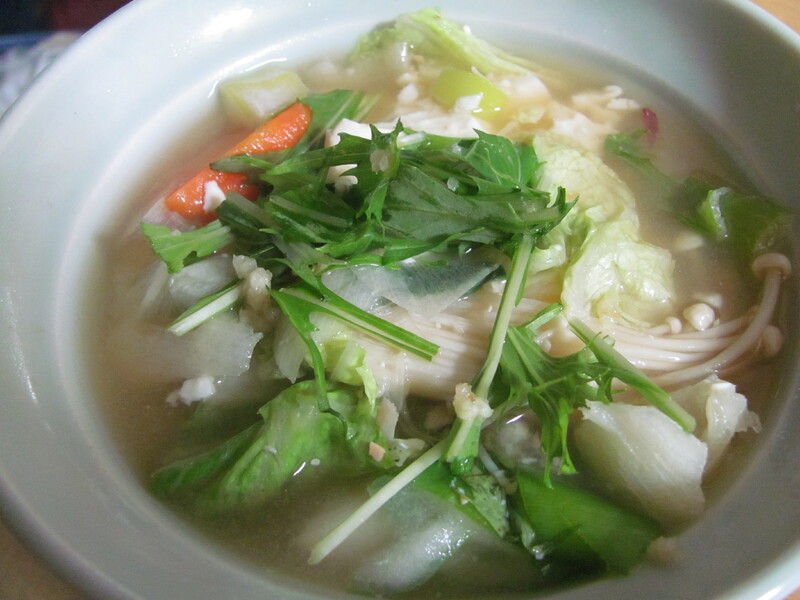 Farewell to Spring: Spring Miso Soup – I'll Make It Myself! Bamboo season is pretty much over, but I wanted to share my new favorite miso-based soup recipe. Despite it being a down year for bamboo, I managed to score a couple shoots at a colleague’s bamboo-picking event. In order to avoid turning into a panda, I ended up freezing about half of my yield. After you cook your fresh bamboo (guides from The Lobster Dance, Hokuriku Expat Kitchen, and Mad Silence), you can freeze it. To defrost, pop it in the fridge for a day or two. Like beans, bamboo should not be defrosted by heating or it will get mushy. The reason why this soup is delicious and my prior miso soups were terrible is because I would boil all the vegetables in the stock, then add the miso. By cooking the vegetables in sesame oil first, they have a better texture and flavor. Of course, you can swap in any seasonal vegetables you like for this, but be sure to cook them in order. Dense vegetables and roots that take a while to soften (carrots, potatoes) should go in first, and vegetables and mushrooms that merely need to wilt slightly should be cooked just to that point before adding to the soup. Serves 3-4 as a main dish or 4-6 as a side dish. Wash and peel the potato and carrot. Slice the potato into eighths; cut the carrot, sweet potato, and bamboo shoot to about the same size. Heat sesame oil in a large frying pan. When it is hot, add the potato, sweet potato, and carrot and cover with the lid. Stir occasionally and don’t let the vegetables brown. Add the dashi to the water and set to boil over a low flame. When the potatoes and carrot are slightly softened, add the bamboo and cook for about 5 minutes. Wash the enoki and slice off the bottom of the root. Break into smaller clumps and add to the frying pan. Wash the cabbage and roughly chop. (If you are going to serve this more than a day later, wait to add the cabbage until just before serving.) Add to the pan and cover with a lid for about one minute. Add the vegetables to the stock and turn down the heat. Break up the tofu into bite-sized chunks with your hands and add to the soup. Let simmer for a few minutes until the vegetables are softened to your liking. Garnish with mitsuba, diced green onions, and grated ginger before serving. *I consider myself a “vagueatarian”: I do eat meat, though I mainly stick to chicken and fish. However, the majority of my home-cooking is vegetarian due to the fact that, not only do I love tofu and vegetables, but tofu is extremely cheap and doesn’t require me to sterilize everything afterward. **I used a locally made organic low-sodium miso (genen, 減塩). May substitute red miso (aka miso 赤味噌) or awasemiso (合わせ味噌). Pingback: Okara Burgers, Two Ways « I'll Make It Myself! I have a friend from Japan that would love this recipe. Unfortunately, I have many friends in the United States that would like to try it too, but can’t acquire the potatoes necessary to get the flavor just right. As a bit of “throwing caution to the wind,” I told them that if they can’t get the Japanese style of new potato, to simply use an Idaho potato prepared as described in the recipe. I also told them that if they make this substitution, that it would impact the final flavor of the dish. Am I wrong for making this suggestion? Thanks for asking! For a soup like this, substitutions should be fine, but I understand what you mean about the “new potato” flavor. From poking around the Internet, it seems like substituting small yellow or red potatoes would be suitable. (One source: Idaho Potatoes Dr. Potato Blog.) I’m quite fond of small red potatoes for roasting, too. I hope this helps your friends–if they try it, please let me know how it goes. Sorry for the delayed response, but my Japanese friend loved the dish. To arrange leftovers the next day, she had some small cut vegetables left in the soup, so she added some Dashi, water, miso and some chicken that was pan fried with butter. She also sliced up the remaining vegetables that she had left over and pan fried it in some butter, cheese, cooked rice and added it to the soup and boil for 3 minutes. She cut the flame and added a teaspoon of soy sauce and some green onions for garnish. She added that she remembered seeing that Roksabrou Michiba of Iron Chef fame used miso and cheese on one show, and the combination proved to be tasty with the panel. She added soy sauce because the flavors were well matched and it went well with the fermented foods. Anyways, that was my report, as late as it is. Glad to hear she liked it, and the leftovers sound really good, too! Thanks for commenting.